Ethiopia's new prime minister, Abiy Ahmed, has pledged his readiness to resolve disputes with neighbour Eritrea. 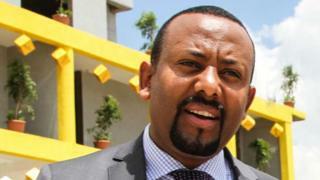 Speaking on state television after his swearing-in ceremony, Mr Abiy called for an end to "years of misunderstandings". "I call on the Eritrean government to take the same stand," he said. The two countries have had poor relations since a two-year border war, which claimed 70,000 lives. Mr Abiy - who was chosen to lead the ruling coalition after the unexpected resignation of Prime Minister Hailemariam Desalegn in February - said the country was ready to resolve differences between the two peoples, who are "not only intertwined in interests but also in blood". "We will stand by our African brothers in general and our neighbours in particular, during good and bad at times," he said. But Eritrea's information minister Yemane Gebre Meskel told the BBC relations cannot be resolved until Ethiopia withdraws "from the occupied territories". Ethiopia still holds land at the heart of the 1998-2000 conflict, around the town of Badme, even though an international court said it fell within Eritrean territory more than 15 years ago. "The ball has stayed for too long in Ethiopia's court," Mr Yemane said. "There is no dispute as the litigation process ended 16 years ago. Ethiopia needs to honour its treaty obligations and respect Eritrea's sovereignty and territorial integrity by withdrawing from the occupied territories - including Badme. "Peace will indeed be beneficial to the two peoples but obviously, this must be predicated on respect of international law, which Ethiopia continues to flout to date." Mr Abiy is Ethiopia's first Oromo leader - an ethnic group which has been at the centre of anti-government protests since 2016. State television channel ETV broadcast his speech live after he was sworn in. Mr Hailemariam, while in power, had accused Eritrea of backing anti-government protests in the country. The two countries fought a bloody two-year struggle between 1998 and 2000. Eritrea had previously fought a 30-year independence campaign against Ethiopia after its annexation in 1962.